The "t" is for turbo. 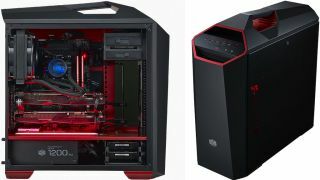 Cooler Master today announced a new case for gamers, the MasterCase Maker 5t, with a dual tone red and black design that people will probably either love ("Looks rad!") or hate ("WTF was Cooler Master thinking!?"). Obviously Cooler Master was shooting for the former with what it admits is an intentionally bold aesthetic. "We wanted to go for a sharper, bolder look, like a sports car," said Mark Severin, head of case product marketing at Cooler Master. "In the case of the MasterCase Maker 5t, we added in a few extras that cater specifically to gamers." One of those extras is a built-in carrying handle. It's made of steel and wrapped in rubber to both accommodate heavy builds (up to 28.5 kg of cargo) and sweaty hands. Also aimed at gamers is a graphics card holder to prevent heavier ones from sagging or putting undue stress on the motherboard. It's basically a steel bar that runs vertically in the case with clips that extend out and prop graphics cards up. This is another modular case from Cooler Master. Magnets grip the front and top panels, which users can remove and ultimately build upon. Meanwhile two tinted tempered glass side panels with key locks provide a view of the interior. The inside can be modded too. Several parts click into place so that users can shuffle things around as they see fit. The entire concept is what Cooler Master refers to as its FreeForm modular system. "Whether you're going for 4k, 144Hz displays with high frame rates, or you just want to build a stunning rig, there are plenty of ways to get there by customizing the internal layout. Quickly slide, clip, rearrange or remove parts to support up to six fans, ten HDDs," Cooler Master says. Three included 140mm fans tackle cooling chores and there's room to add up to three more. The case also supports liquid cooling radiators up to 280mm in the front and top, and up to 140mm in the rear. The MasterCase Maker 5t is available to pre-order now direct from Cooler Master for $250 and is expected to ship around December 22. It will be available around the same time at local retailers in the U.K. for £230 including VAT.